2100sf, Luxurious, huge corner condo. One building from the main pool and clubhouse. Dark wood floors in living area, new carpets in the 3 bedrooms, all new paint, appliances and furnishings. Cool mid-century modern style. Spacious loft feel. 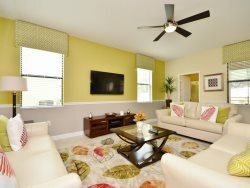 You will love returning to this calm, open plan home after a long day at the theme parks or convention center! The unit is furnished and decorated with the highest quality pieces, sumptuous bedrooms and styling living areas. The vast open-plan, loft style living area has dark wood floors and porcelain tiles and includes a den with work desk, Smart TV and sofa bed for 1. New appliances in a full kitchen with granite work tops plus everything you might need for a quick breakfast to a gourmet meal. The cook can chat with guests perched at the bar or relaxing in the living area. The kitchen flows seamlessly into the wide open living area and den where there is a lovely mid-century inspired dining area for up to 8 (makes a great boardroom table!) and a luxurious family sitting area with a 55" Smart TV. The living room leads out to a furnished patio where you can enjoy cold drinks on warm evenings. This super spacious home offers 3 bedrooms. The master suite with a King bed and new Sealy Posturpeadic Euro plush pillow top mattress and top quality linens, a 32” Smart TV, walk in closet and a vast en-suite bathroom with oversized soaking tub, large walk in shower, his and her double vanity and screened toilet. The guest wing offers a king bedroom with a 32” smart TV, and another bedroom with 2 full beds and a 32” smart TV. There is also a full family bathroom. A full size laundry room in the unit means you can pack light and save suitcase space for outlet shopping! 7 miles from the Walt Disney World Resort, 5 miles from Universal Studios, 3 miles from SeaWorld and 45 miles from Legoland. Golf at Marriot's Grande Pines Golf Club is 3 miles. Groceries across the road and restaurants less than a mile away. This home sleeps 6 people. By law we are required to display the maximum number of people a home sleeps. You may not exceed this number (6) at any time during your stay.